The Women of Shir Tikvah is a vital arm of the congregational family. We organize and encourage participation in religious, educational, financial, community and social activities. We foster and further the ideals of Judaism, support the congregation and develop close relationships among members. 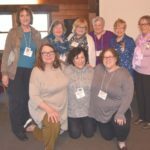 We are stronger together as we collaborate and cooperate with our fellow sisterhoods in Women of Reform Judaism (WRJ)and WRJ Midwest District. Our activities include providing stimulating programs and networking opportunities. The Women of Shir Tikvah promote and support congregational fundraising. Our activities include Break-the-Fast, book reviews and discussions, theater outings, Sisterhood Shabbat and our annual community Seder. We also oversee Oneg Shabbats and the temple kitchens.